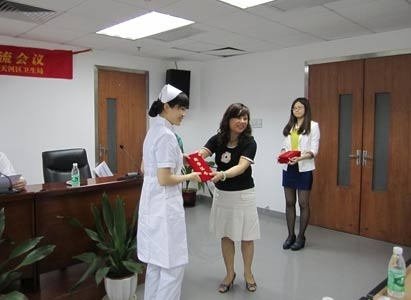 On May 8, 2013, Outstanding Nurse Award Ceremony by Health Bureau of Tianhe District and Nursing Communication Meeting was grandly held in the Health Bureau of Tianhe District, Guangzhou. On behalf of the leadership of Health Bureau of Tianhe District, Tan Wei, Deputy Director of Health Bureau of Tianhe District, made a passionate speech and expressed holiday (Nurse’s Day) greetings beforehand to all nurses working hard on their nursing posts for a long time. He greatly praised their nursing work and expressed his sincere hope to them. 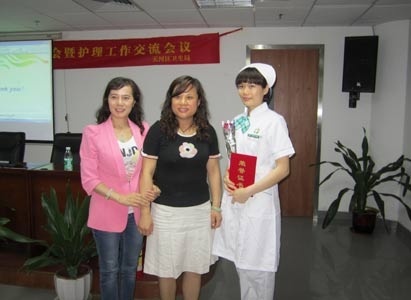 Deng Caiyu, nurse from the 7th floor of Oncology Department of Modern Cancer Hospital Guangzhou won the honorable title of Outstanding Nurse of Tianhe District. It is said that since Modern Cancer Hospital Guangzhou was built, nurses from this hospital have seriously learnt the noble quality of Nightingale’s humanitarianism and kept her oath and responsibility in mind. They have kept improving their professional competence and given nursing job a profound connotation with their excellent nursing skills and normal nursing services, which makes their nursing work fruitful.